Take maida, add salt, 1 teaspoon pepper, 1 glass of water and mix it well. The batter should be thin-if it is still thick then add some more water. Keep it aside. 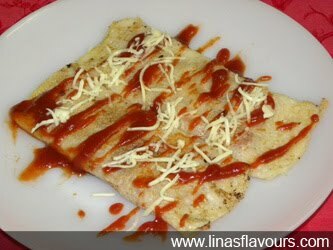 You can even try one dosa and then add water if you feel it is thick. Take onions, cut into long stripes. Take 1 teaspoon of butter in kadai, add onions, salt, remaining pepper and sauté onions for about 4-5 minutes till it turns light brown. Switch off the heat. Add tomato ketchup and cheese and mix it well. Take a non-stick tawa and heat it. Put about ¼ teaspoon of oil and put 1 big spoon of maida mix, spread it slowly and evenly to make thin dosa. Cook it on both the sides. Put about 1-2 teaspoon of onion stuffing in the centre and fold it from both the sides. Cook for about ½ a minute.